How would you like £100, perhaps even more, for doing nothing more than switching your bank account to a different provider? Sounds very nice, doesn’t it? If you’ve so far resisted changing bank accounts because you’re fairly happy with your current provider or you’re put off by the potential hassle of making changes to your financial setup, a new wave of offers are aiming to make switching too hard to resist. Today we’re taking you through the ins and outs of switching and outlining some of the UK’s best current account switching deals, so you can decide if it’s time for you to make a move. What’s on offer when you switch? And just so you don’t count your chickens before they hatch, if you’ll excuse the Easter pun, not all of the cash incentives are payable instantly upon switching. With this in mind, make sure you’re aware of what conditions you need to meet and when the cash will be released. Is switching current accounts for cash worth it? If you’re feeling dissatisfied with your current account provider and your bank account doesn’t come with a lot of perks, the decision to switch may be an easy one. However, you need to be aware of the impact switching may have on your wider financial arrangements before you commit to moving. Some customers may have a special mortgage, savings or home insurance deal that’s linked to them holding a particular bank account. If your present bank account includes extras such as travel insurance or a free fixed overdraft that won’t be included in your new account, you’ll need to weigh up the impact on your outgoings. For those moving to a paid account where the monthly fee is waived when certain stipulations are met or for a fixed amount of time, would the switch still represent good value if you needed to pay the fee? Before you allow yourself to be wooed to a new provider with the promise of cold hard cash, you need to weigh up properly if the deal is worth it in the longer term and not be distracted by the initial incentive. Some bank accounts actually give monthly rewards such as money back on household bills or money to spend on store gift cards but may have a lower initial cashback fee, which deal is right for you? Be sure to check out our best rated current accounts and winners in the Smart Money People British Banking Awards to find out about levels of satisfaction in current accounts and see if your potential switch would take you to one of the best performers. What is the Current Account Switching Service? Introduced in September 2013, the Current Account Switching Service (CASS) introduced an easier process to help customers switch accounts more easily. You can find full details of CASS online at simplerworld.co.uk but the key points you need to know are that the whole process of switching can now be completed within seven working days. Plus, over 40 UK banks and building societies are signed up the service. To instigate a current account switch, you’ll need to agree both the ‘current account switch agreement’ and ‘current account closure instruction’ provided by the relevant banks and select a day for switching. The date will need to be at least seven working days in the future and should not be a weekend day. You’ll be able to use your old bank account right up until your switch date, when your balance, all your incoming and outgoing payments and monthly commitments such as direct debits and standing orders will transfer over to your new account. If you have an overdraft, you’ll need to be sure your new bank will honour it so that it is also transferred over. What’s more, a little like when you get your mail redirected, any payments that are accidentally assigned to your old account will be redirected for up to 36 months. Under the current account switching service guarantee, not only is this service free to use but if there are any issues with the switch you will be contacted before your account switchover date and if anything goes wrong any interest or charges incurred as a result will be refunded. Want to know what our customers say about the CASS? Check out our post on what goes on in the mind of current account switcher. Want to start checking what’s in it for you? 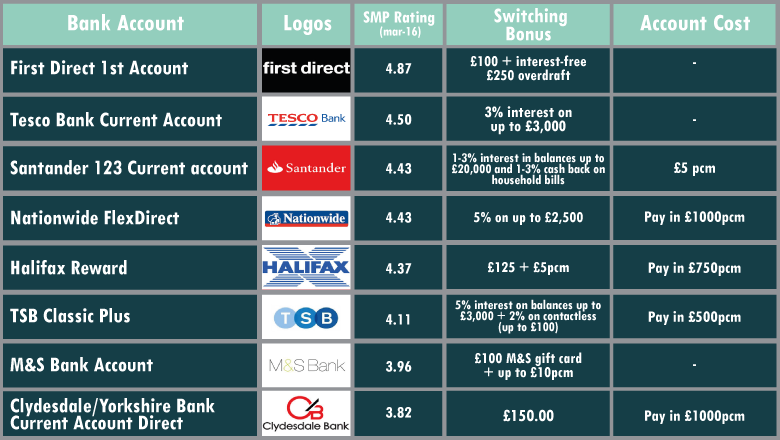 The table below shows some of the top current account switching deals available right now. If you are planning on changing accounts it’s worth remembering cashback offers are also available through sites such as Quidco, These operate slightly differently but could mean if you’re attracted to features of a particular account and the provider is not currently offering a switching incentive direct, you may still be able to get some money from the move. Is it time to start your search for a new current account? If the deals above have got you wondering whether your bank account is doing enough for you take a look at the names in our best rated current accounts, which features the likes of First Direct and Nationwide, who have a switch deal available right now. Remember: it’s not just about finding the biggest cash incentive for switching, drill down to the nitty gritty to find the best features and on-going rewards for you! Happy with your current account? Share your opinion and help out our community by writing a review.